In 2013, the General Assembly adopted the Dublin Peanut Festival as the State Official Peanut Festival (Session Laws, 2013-313). The bill to select the Dublin Peanut Festival as the official State Peanut Festival was introduced by Rep. Bill Brisson of Bladen County. Met with little opposition, and was passed in the House of Representatives with a vote of 117 to 0. Dublin North Carolina, sometimes called the 'peanut capital of the south' is the home of the Dublin Peanut Festival. In the 1992 the city needed a way to raise funds to build a gymnasium for Dublin Elementary School. They decided to hold a peanut festival to both earn money and honor their agricultural heritage. The festival was held in September of 1993. It was successful and became an annual tradition, now always held on the third Saturday of September and drawing crowds of over 3,000. 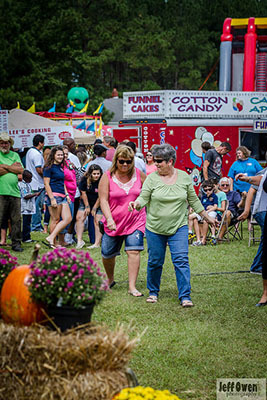 The Peanut festival's many notable events include a parade, a car show, a barbecue plate sale, kiddie & women's tractor pulls, a corn hole tournament, a cake sale, a peanut-themed cooking contest, and a scholarship pageant. The festival also boasts many craft and food vendors, live music, and games. The Cape Fear Valley Medical Center holds a blood drive in concurrence with the festival. AN ACT ADOPTING THE DUBLIN PEANUT FESTIVAL AS THE STATE OFFICIAL PEANUT FESTIVAL. "§ 145-47. State peanut festival. The Dublin Peanut Festival, held the third Saturday of September of every year, is adopted as the official peanut festival of the State of North Carolina." "Dublin Peanut Festival slated for Sept. 21," Sampson Independent, The (Clinton, NC), August 31, 2013. "How your legislators voted, May 20-24," StarNews (Wilmington, NC), May 25, 2013. Will they have BOILED PEANUTS?